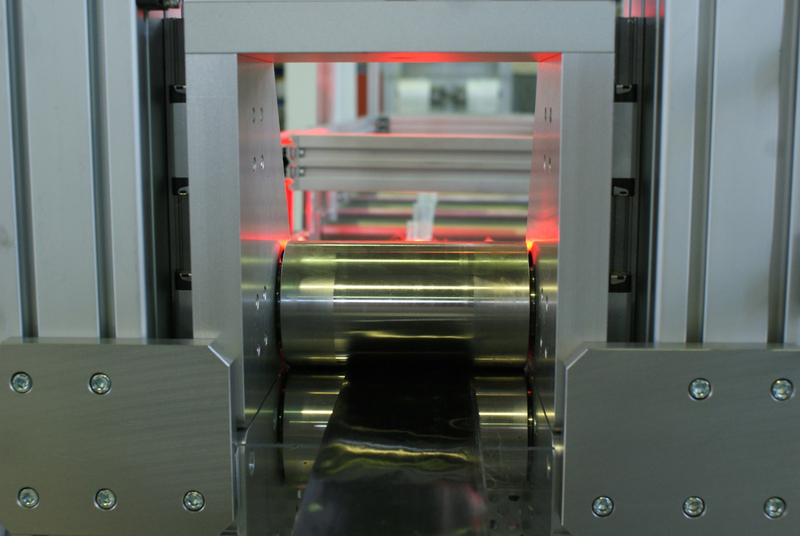 The IKV Institute of Plastics Processing at RWTH Aachen University has brought a new unit for the production of unidirectional (UD) tapes into operation. The unit works on the principle of extrusion-based melt impregnation and has an online quality assurance system. IKV is using the new unit to research the interaction of measurable quality parameters and the cost-efficiency of the process. 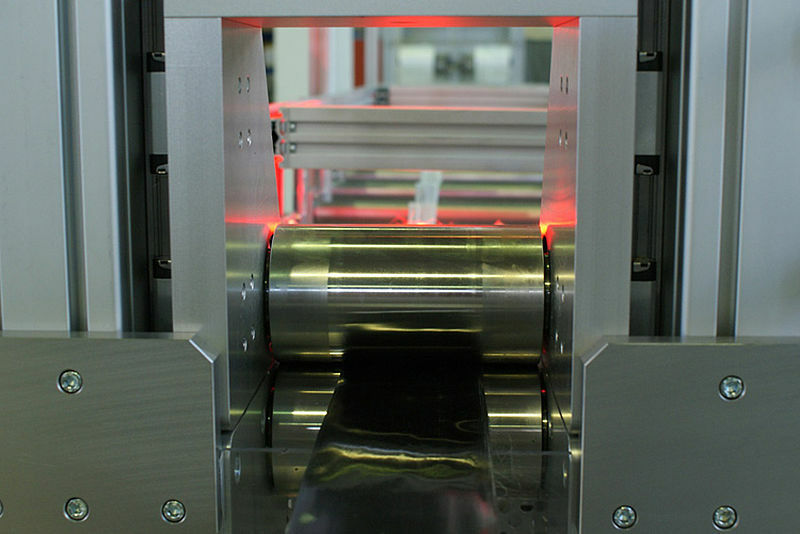 The tape unit was developed jointly with partners Breyer Maschinenfabrik, Pixargus, F.A. Kümpers and KUKA Industries and has been set up in the IKV’s Development Plant for fibre reinforced plastics. UD tapes made of carbon or glass fibre with thermoplastic matrix systems offer a very high level of lightweight construction potential. A wide range of applications are conceivable employing local reinforcement in injection moulded plastic parts, hybrid metal components or pure FRP components, achieved through tape laying or tape winding. The UD tape determines the component quality and the cost-efficiency of the process to a decisive extent through its properties such as tolerances, homogeneity and the degree of fibre impregnation. On the new unit, the interactions that result between tape quality and the selected method of further processing, e.g. tape laying, tape winding or injection moulding, are being tried out and assessed. The tape unit can be used to produce UD tapes with a tape width of 25 to 75 mm and a tape thickness of 0.1 to 0.3 mm, employing a production speed ranging from 0.6 to 10 m/min. It is possible to process glass fibres (> 2400 tex) and carbon fibres (> 24K) using polypropylene (PP) or polyamide (PA) as the matrix. An optical quality assurance system captures fibre spreading as well as gaps and overlaps. 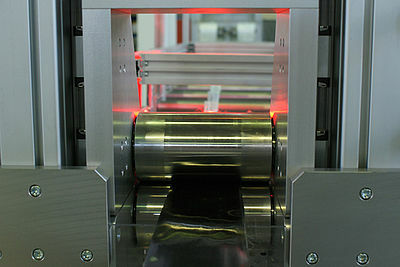 It also conducts continuous measurements to determine the tape width and tape thickness. At present, the quality assurance data is being used to correlate the process parameters and the tape properties, with the aim of aligning the spreading and impregnation process to the desired property configuration. In addition, the IKV scientists are deriving the interaction between the tape characteristics, the downstream processing (e.g. injection moulding, tape laying or thermoforming) and the quality of the part. The focus is on the interaction between the tape properties – especially the degree of impregnation and the fibre distribution – and the resulting component properties, which are conditioned by the downstream process employed. Apart from the research activities conducted to date, the newly installed tape unit also makes it possible to process a wide range of materials, thus permitting its use for the development of new materials for UD tapes. The research work is being funded from the public purse by the Federal Ministry of Education and Research (BMBF) in the Lightflex project.